La Paz (The Peace) is the capital of Southern Baja California, nestled in Bahia de La Paz, and is the gateway to the Sea of Cortez. My first of eight trips here was in 1994, and in writing this article it caused me to long to dive here once more. I’m now making plans to do so again this year. What made me fall in love with this place? Especially as a dive destination from the USA - it’s a short flight, and you can pay a lot less to see a lot more. Whales Sharks are there, if you go in season. The juveniles come in October and November. Big adults show up in the spring. You might see a Hammerhead or a Manta if you are lucky - although a hammerhead is more likely than a Manta. You can see Tuna, Wahoo, Jacks, Baitballs. 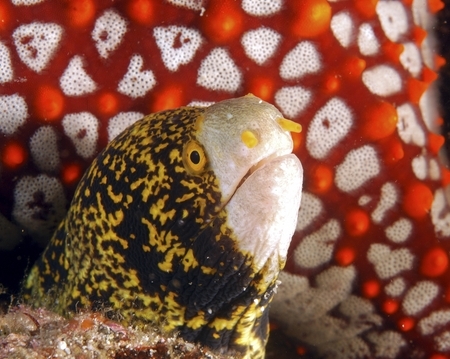 Lots of other fish, lots of moray eels, lots of sea lions. 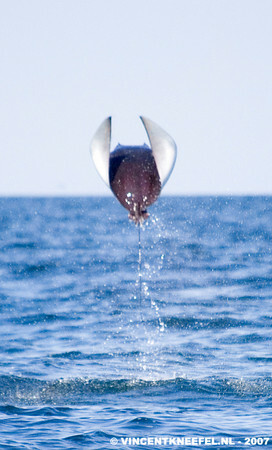 There are Mobula rays in season. Twenty years ago, the La Paz area was home to countless hammerhead sharks, and over 50 distinct giant manta rays. The diving was better than Cocos Island. Most of them have all been killed. You can read this report to find out what happened to the sharks, (it's a pdf file) - but I have to warn you , it's very sad. As far as I’m concerned, there are three places to dive here. In order; El Bajo, La Reina, Las Animas/San Francisquito. All else, though can be wonderful sites, are just second best. Remember the old 1980's underwater films with clouds of hammerhead sharks? This is the place it was filmed. This is a seamount rising to 60 feet from the surface, miles from the nearest island. Definitely an advanced dive. Clouds of fish overhead, chances of seeing many pelagic fish, manta rays, whale sharks, other sharks, tuna, wahoo, etc. Tons of morey eels at the eels condos. I’d suggest a wide angle lense for this dive. Hammerheads can be scene through out the year, but you have to be very stealthy and with sparse company. Bubbles spook them. However, if you aren't seeing big stuff, this site isn't the most exciting one to photograph on. A rock with a light house at the northern tip of Cerralvo Island. This place can have wicked currents. Great rock reliefs, manta rays, biggest bait ball I’ve ever seen, tons of fish. This can be a white knuckler (rough journey), but well worth it. If the vis is bad at the main diving sites, it can be great here. 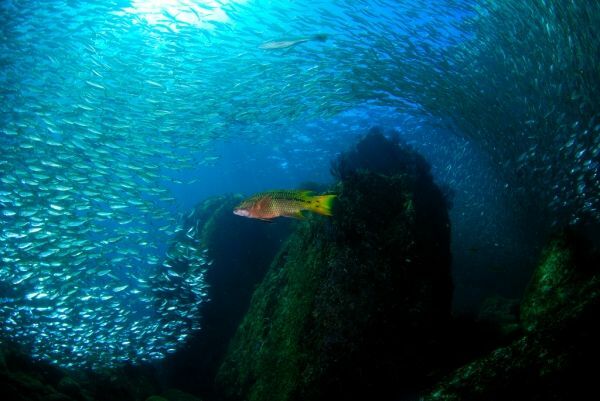 You can see schools of jacks and barracuda here. The currents seems to keep this site cleaner. 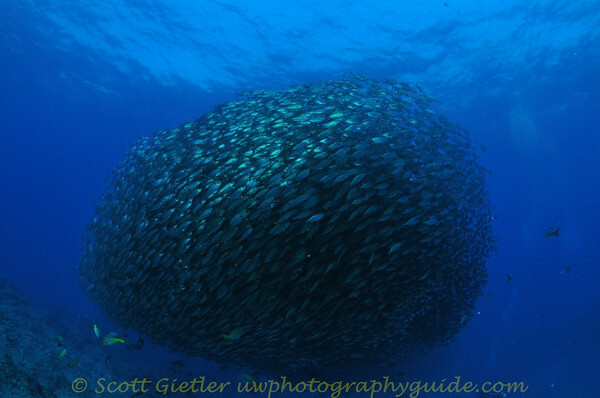 Giant baitball at La Reina, in the Sea of Cortez. Actually two separate dives. I lumped them together, if you’re doing a week, or more of diving, you may want to make a stop at one of these. It’s a long trip and not much in the way of backup sites if they’re a bust. La Animas is a collection of rocks in the middle of nowhere. Great dive spot, schools of jacks and lots of reef fish. San Francisquito is another seamount, deeper and not as large as El Bajo. Lots of black coral. 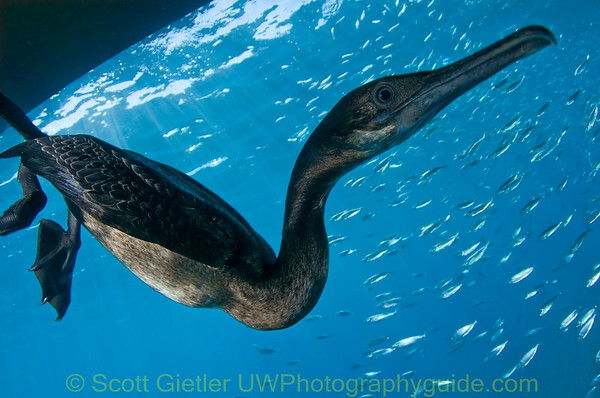 It’s not uncommon to see pelagic fish at any of my top dive spots. These spots are so far way from the first two spots, that if conditions are not good there, it may be good here. Now for the ‘second best spots’ these are good for a ‘third’ dive and one or two visits per trip. Los Islotes, the sea lion colony. Need I say more? Lots of sea lions that are use to us swimming up to them. The juveniles will mug for your camera. And the big bulls will bark at you when you get too close to his girls. The rock itself looks like a pterodactyl should be flying overhead. I also saw my first seahorse and jawfish here. Early fall will have the curious juveniles in full caffeinated mode. Earlier than that, you may see birthing of the new generation. Later than that, the population will be at a minimum, as the group is out fattening themselves up. Short drive from Los Islotes. 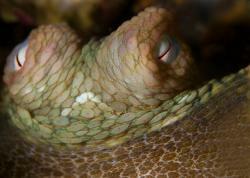 Bring your macro lens on this dive. Tons of little critters hiding in the fissures. Don’t forget to put on your nudibranch lens on for this site. A shallow site that can have a significant current. The third dive for La Reina. It's a rock off of Cerralvo Island. Great structure on the backside, a cave on the inside full of glassy sweepers. Clouds of tiny fish swarming all around. This must be a nursery for lots of fish. In the sand on the inside, you can find a field of the evil garden eels. They taunt me and my camera. I once set my video camera down, and surfaced. The garden eels popped up and inspected my camera. But, not the lens. The shied away from the front of the camera. If the vis is good this is a great macro spot. Also, lots and lots of damselfish mating. It makes a great night dive spot. The wrecks - The Salvatierra, with was sunk by the Swanne Reef. A couple of other ships were purposely sunk to become a reef. Are also a good diversion to make a third dive without absorbing too much additional nitrogen. They’ve all been down a while and have become a picturesque reef. Don’t forget to make a fourth dive. 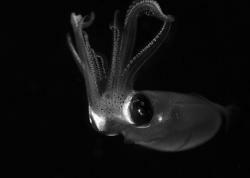 A night dive. 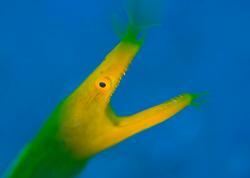 Swanne is tops, or try Light House Reef. The synapted cucumber feeding is a strange sight. At the end of the dive, look up at the sky. Being so far away from city lights there is a blaze of stars overhead. Sea of Cortez itself is a great photop. The boat trip to the prime spots can take some time and cover a lot of open water. Water that contains dolphins, whales, mobalas, pilot whales, jelly fish and so much more. If you’re with a small group. Ask the divemaster to drop you in the water. The islands themselves are quite scenic. So don’t forget to bring a topside camera. There are direct flights into La Paz from Los Angeles and Mexico City. Flights also go to San Jose Del Cabo and the resort will bus you to La Paz (2-3 hours). The city of La Paz is a bustling City, unconcerned if you’re a tourist. The Malecon area, definitely sees you as a tourist, in a laid back sort of way. This is not Cabo San Lucus nor Cozumel. The diving is way out town. To get closer to the diving, with less boat time, I’ve been diving with Club Cantamar. This is a divers' resort. If you are not here to dive, you’d better enjoy reading books. They have spacious fast boats. September to November is best. October is reputed to be the prime time to dive Baja. Though on most Octobers I see a hurricane/tropical storm heading towards La Paz. And, it is crowded. Barring the first two negatives, it can be great because the water is warm and clear. 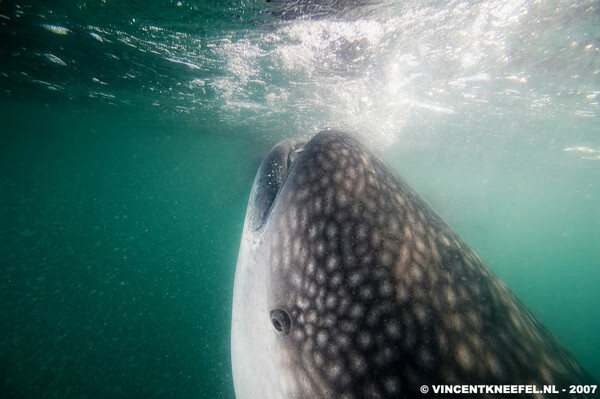 This is when the whale sharks come into the bay to feed, although the visibility here will not be great. After all, the plankton is what attracts them. I’ve done most of my trips in the summer months. Dec 15th - April 15th can be quite windy, and the summer is very hot. July to Dec has the clearest water. Most all of what I mentioned above was spotted in the summer. If you don’t see it on your first trip, you’ll have to make a second trip. It can get crazy hot, but it’s dry heat! On the water it is quite nice. Water temp can be 65 to 75, you can have plankton blooms or great vis. Once I went in January, when no one else was at the resort, and we did El Bajo. I started this article mentioning the schools of hammerheads. We saw them then. 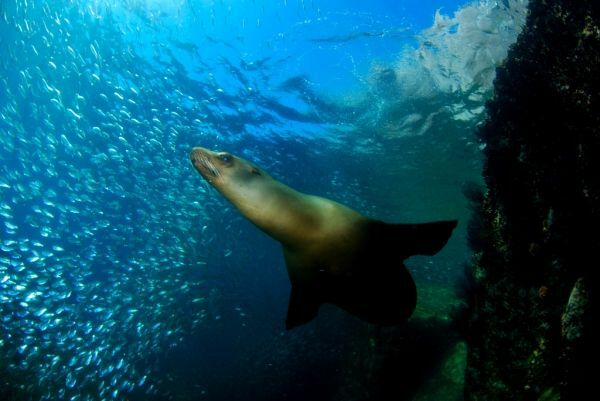 Diving La Paz, Baja is like a ‘a box of chocolate, you never know what you’ll get’. But, you could pay a lot more and get a lot less. 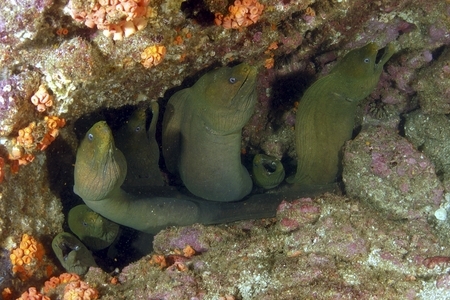 7 Moray eels! 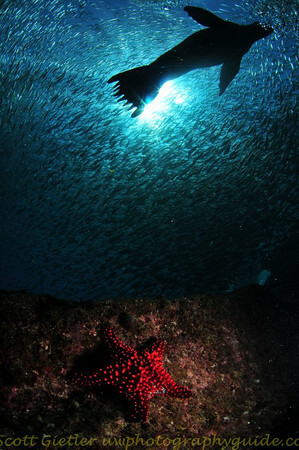 Another great sight seen underwater while diving in Baja. Photo by Linda Blanchard. Submitted by DaveO (not verified) on Wed, 2012-07-11 18:29. Great photo work here. I've been thinking of a dive trip to La Paz with a side of golf, so this was good information. 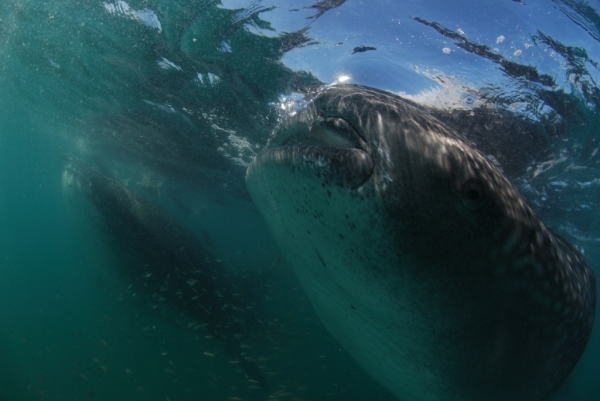 Hopeing to get close to whale sharks. You're right, it was a sad story about the Hammerheads. I hope the government does something to stop the netters. Submitted by Glory (not verified) on Thu, 2012-05-10 14:20. I'm a novice diver and was wondering if you can give me an idea of any reputable dive shops in LP. I'm going in September and I'm so glad I stumbled upon your fountain of information here! Submitted by Danny Foo (not verified) on Sun, 2010-03-28 09:48. Sorry should be spotted an error. Just realized I addressed to wrong author. Anyway great job Walter and great photos! Submitted by scottg on Sun, 2010-03-28 23:06.